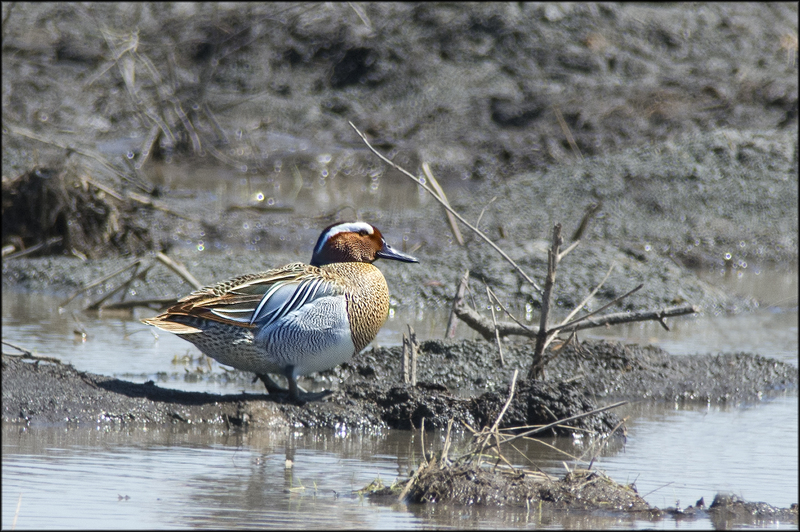 The other night Rick Poulin called to tell me that a ABA-Code 4 Garganey was being seen in Mirabel, Quebec and it had been there since April 27th. I hoped it would stick around. I had to work my night shift and I had made plans to play golf on Friday at 7am. My mind wasn’t really on my game that morning so when I finished the 18th and was on my drive home and bed. My obsession got the better of me I decided I couldn’t wait. I called Rick and we left for Mirabel at noon. I set my GPS for Mirabel and the intersection of Monte Guenette and Rang Ste-Marguerite. We took the Queensway to Cumberland, hopped the ferry to Buckingham (9$), got on the Hwy. 50 all the way to the end of the road, just after the Mirabel Airport. Turn left and then left again on Montee Guenette and follow it to Range Ste-Marguerite which is your first right. We were there in 1.75 hours, and the views were spectacular. On both sides of the road there are flooded fields and there were at least 2-5000 Snow Geese, quite a few Blue morphs, Canada’s and Pintails. I’m sure there were other birds but we were there for the Garganey. I scoped the wet area south of Ste-Marguerite, just when I was about to give up and start on the north side, a bird caught my eye. It was about the size of a teal but the head color was different. There it was, a Garganey, a tough ABA bird, due to declining numbers in its range. Bird 644 for my photo quest, I can almost taste 700. I read in the ABA blog that between 1970 – 2003 the Eastern Asia population of Garganey dropped from 90,000 to 22,000. Thanks Rick, for the heads up on a great bird. Ciao for now.